This is a huge new feature for the group, when i joined a little over a year ago i had brought a castle to last years planet comicon and learned only a few mideavil folks in the group. 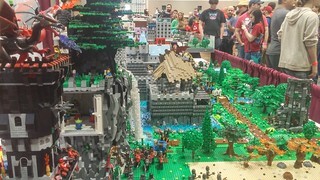 that mostly consisted of train and city modular mocs with a few star wars fans, as the year progressed and i brought larger castle mocs to each event. people started coming out of the wood work and asking if i would lead a mideavil display and when would the best event opportunity be. Last month i put on about a 5 foot by 4 foot display on the side of a city train display during the great train and toy show here in Kansas city, but this upcoming comicon will feature only 5 sets but just over 20 mocs on a 7 ft by 4 ft display of castles and a village and lots of fun scenes to inclue a scene out of army of darkness when ash first lands, as well as scenes of a catapult from Monty python and the holy grail to bring laughter and joy for ongoing mideavil enthusiast passing our display. i hope to post pics and links for the past train show events and i hope to learn some great building styles from joining this group.